Bitcoin Press Release: Bitcoin alternative DNotes’ co-founder Alan Yong will be joining the “Innovation Spotlight: Digital Currencies” panel at Silicon Dragon, to be held at the NASDAQ on June 22nd, 2015. DNotes is a second generation digital currency focused on long-term adoption, scalability, and solving real-world issues. DNotes co-founder Alan Yong is pleased to be joining the Innovation Spotlight: Digital Currencies panel at this year’s Silicon Dragon event, to be held in New York at the NASDAQ on June 22nd. Alan Yong is an experienced tech entrepreneur having founded personal computer company Dauphin Technology in 1989. Francesco Rulli, President of bitLanders and bitCharities, will also be part of the panel, along with Sarah Martin, VP at Digital Currency Council. The panel will be moderated by Porter Bibb, Managing Partner at MediaTech Capital Partners. Stable Bitcoin alternative DNotes is focused on long-term adoption and solving real-world issues for the unbanked and people worldwide from all walks of life. 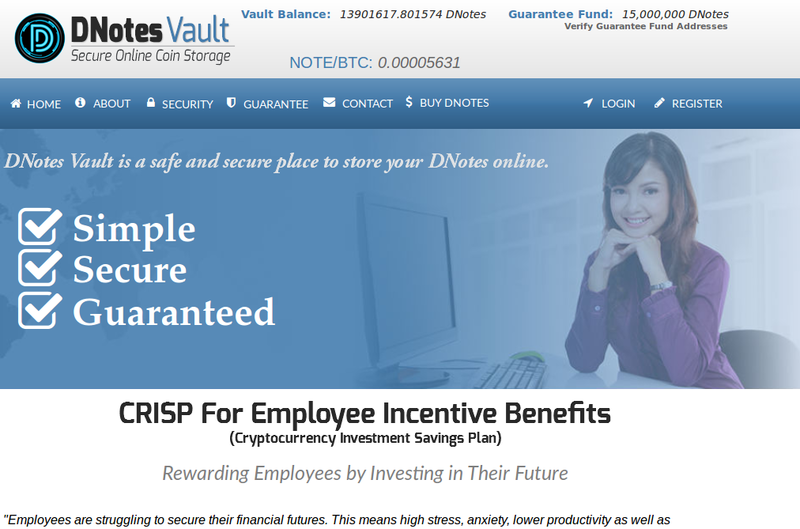 DNotes’ ecosystem includes the world’s first Cryptocurrency Investment Savings Plans (CRISPs) for retirees, employees, students, and children worldwide. CRISPs include a 100% deposit guarantee and bonus interest for retirement CRISPs participants. DNotes also funds cryptocurrency neutral site CryptoMoms in order to aid women’s participation in cryptocurrencies. Bitcoin has correctly been credited as the most disruptive technology in the monetary system since the debit card. However, Bitcoin has been hit with countless negative headlines and has arguably settled with a very limited purpose as a speculative trading vehicle. Some believe Bitcoin is failing to meet the full function of money and gain mass acceptance as it is too costly to acquire, and too volatile as a store of value and medium of exchange. But Bitcoin’s ground-breaking technology laid the foundation for improved and more advanced cryptocurrencies that have a real chance to make it into the mainstream and revolutionize the monetary system just as the debit card once did. The main innovation stemming from Bitcoin is trustless transactions, meaning transactions are fully decentralized and do not rely on a central bank or government. Bitcoin also introduced the primary innovation of blockchain technology; a public ledger where all Bitcoin transactions are recorded indefinitely together with all Bitcoin ‘blocks’ that have been mined to secure the network. DNotes is the second generation Bitcoin alternative digital currency taking full advantage of the pioneer Bitcoin’s innovation while avoiding the pitfalls. It was clear early that DNotes strives to maintain reliable long-term appreciation building stability, trust, and currency value in line with fundamental value. DNotes is a currency with a purpose with global initiatives to help solve global problems. There are currently 2.5 billion people worldwide that do not have a bank account, insurance, or are under-served by banks and financial service companies. DNotes is beneficial for the unbanked as it does not require a stable government, includes inexpensive transactions, minimal exchange fees, and near zero remittance costs for sending money to any country. No ID is required for people who do not have one or do not trust their governments. DNotes has the potential to change the wealth of nations and their citizens by enabling anyone, anywhere to tap into the emerging wealth creation opportunities provided by digital currency. Bitcoin will most likely go down in history as one of the greatest technology revolutions in history. Bitcoin as a currency is an integral part of the technology pack, powered by the Blockchain as the most innovative protocol of decentralized distributed consensus ledger ever conceived. DNotes, designed from the ground up with a purpose as the stable trustworthy digital currency for everyone, is destined to possibly become the global Digital Currency of the future with lasting value. With an ecosystem that currently consists of DNotesVault, Cryptocurrency Investment Saving Plans and CryptoMoms, DNotes is the currency with the highest potential for mass global acceptance. The DNotes ecosystem consists of highly scalable buildings block to expand rapidly on a global scale at the most opportune time. DNotes Co-Founder Alan Yong is a well -regarded visionary since the early days of personal computers. He founded Dauphin Technology in 1989, which had contracts with the US Department of Defense, and is best known for creating the Dauphin DTR, the most powerful window-based miniature computer that competed head-on with Apple’s Newton computer that became the Apple Iphone as we know it today. In 2007, Yong co-founded Smokeys Daylily Gardens, one of the largest daylily growers in the world. Smokeys Daylily Gardens is the first merchant to accept DNotes as payment for its products. In 2014 DNotes founded Cryptomoms.com, an online community to encourage and assist women to participate in the emerging world of cryptocurrencies overwhelmingly dominated by men. Surveys from 2014 show that 95% of cryptocurrency participants are male even though women account for 50% of the buying power. CryptoMoms is a platform fully equipped with a forum, chat, information pages and a full guide on how to store, buy, and sell digital money. It is clear that in order for digital currencies to become truly mainstream the gender imbalance must be corrected. Silicon Dragon is a news, events, and research group covering innovation and investment hubs in the Silicon Valleys of the world, and provides insights to strategize and profit in the world’s top tech innovation centers. The next Silicon Dragon event will be held on the 22nd of June at the NASDAQ in New York where Alan Yong will be attending as a panelist on the Innovation Spotlight: Digital Currencies Panel. About Bitcoin PR Buzz:Bitcoin PR Buzz has been proudly serving the PR and marketing needs of Bitcoin and digital currency tech start-ups for over 2 years. Get your own professional Bitcoin and digital currency Press Release. Click here for more information. This press release is for informational purposes only. The information does not constitute investment advice or an offer to invest.